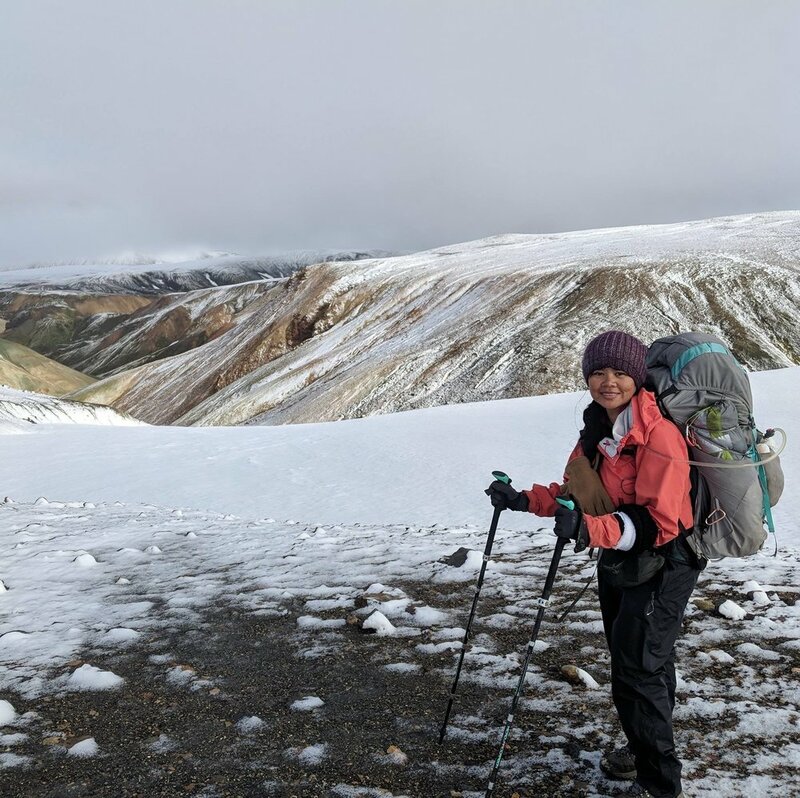 June, July, August and September were my trekking months in North America and Iceland in 2018. Throughout that process, I discovered a few must-have items as a hiker and a thru-hiker of the John Muir Trail. This has been especially true because my preparation for my treks had become more laborious and detail oriented than ever before when I decided to do a solo thru-hike of the John Muir Trail (JMT) in California’s Sierra Nevada. And here’s the thing: Preparation for a thru-hike is no small task. It requires a well-thought out plan in terms of gear but most importantly I faced the most challenging question of all: What do I eat on the trail for 22 days? In all honesty, this took the bulk of my time in terms of pre-trek preparation because it meant having to think through each day’s menu. When you’re done preparing the menu, the other question is, how do you plan to sustain your energy during the tough days when you have to conquer a high pass? On the JMT, for instance, I had to climb up 13 passes in 22 days. If you think about it, the endeavor is akin to a marathon over an extended period of time. One can foresee running out of energy along the way. In my case, I had Tailwind Nutrition to sustain me. What is Tailwind Nutrition? For my JMT trek, I relied on two Tailwind Nutrition products: Tailwind Rebuild & Tailwind Endurance Fuel. Ever feel so exhausted from a hike? I had a few of those moments on the JMT. In fact, I had a number of them. The first two days were grueling as I had to hike up Mt. Whitney, working my way up to an altitude of 14, 505 feet and then all the way down to Guitar Lake. I had a tremendous amount of elevation gain and loss on my first two days on the trail. How did my day feel at every end of it? Quite fatigued from the heavy 40 pound pack, the elevation gain and loss and the mileage. Tailwind Rebuild was my lifesaver! I brought with me a few packets of the Rebuild in vanilla and chocolate flavors. And, I totally felt the difference. First of all, the Rebuild shake is easy to prepare. Just add water and shake. I love the efficiency in preparing it because as you can imagine when you have an exhausting hike, it’s hard to jump directly to cooking your meal. Tailwind Rebuild gave me the “recovery” period that I needed before performing the necessary tasks when I arrived at camp. Rebuild works! As the name indicates, this product is meant to help your muscles recover from a long day of hike. It provides you the necessary energy to return to your baseline and replenish your body with electrolytes. After a few minutes of drinking it, I can certainly feel a difference. I feel more energized and ready to tend to whatever I need to do for the rest of the day on the trail. The taste is great. One thing I worried about consuming a nutrition drink is the taste. Tailwind Rebuild definitely lived up to my expectation. In fact, I enjoyed the taste of this drink that I looked forward to it as a reward after a long day. Both the vanilla and chocolate flavors are delicious and have the right sweetness to them. It turns out that the great taste is attributed to its vegan ingredients. There’s nothing I don’t like about this powder shake drink. I highly recommend it for any avid hikers who wish to end their day with a replenishing drink that satisfies. What can one do to prepare for a grueling climb up a pass or a number of them? Tailwind Endurance Fuel was the answer in my case. In the 22 days I hiked the JMT, I made sure on the mornings I had tough climbs scheduled within the first hour or two, I added a few scoops of the Tailwind Endurance to my water bottle or bladder (as per the recommended daily consumption) to ensure I was hydrated and had the extra nutrients that will help me conquer the pass(es) with ease. What do I love about this product? The sweetness level is great. I have tried chews and gels for my hikes in the past and they were too sweet for my taste. Tailwind Endurance Fuel tastes great and it’s light. I never got an upset stomach from it. Just like the Rebuild, this one works its wonders as well. I stayed hydrated on my hikes on JMT. I completed the JMT in August and it was hot! With the Endurance Fuel, I didn’t have to worry about suffering from dehydration. Plus, it’s so efficient as you simply add scoops to your water bottle or bladder. The powder dissolves fast and leaves no residue on my water bladder like other products tend to do. I had winter in August in Iceland. Because of its valuable nutrients, I always felt fuller when I drank it at breakfast. While the Rebuild was ideal for the end of the day, Endurance Fuel was my go to drink in the morning. I had the caffeinated Endurance Fuel (Green Tea flavor) just for that added kick of caffeine. I was so happy with the results that I ended up taking this drink with me to Iceland after my JMT trek where I completed the Laugevagur trek which proved to be challenging as I endured a snowstorm and a hike through heavy snow. The Tailwind Endurance Fuel got me through that tough hike most definitely! After experiencing Tailwind Rebuild and Endurance Fuel, I find it impossible to return back to other products in the market that promise, but fail to deliver, the same results. I was highly impressed with both products. For future treks and thru-hikes globally, I will surely rely on Tailwind for the extra boost. These Tailwind products have passed the test. They got me through the 22 days on the JMT successfully. Now, I recommend it to everyone including my backpacking students and trek clients. To learn more about Tailwind products, go here. Disclaimer: Although Tailwind provided me products in support of my JMT thru-hike, my review of Tailwind products constitutes my sole opinion as consumer of said products.